PepsiCo entered India in 1989 and has grown to become the country's largest selling food and Beverage Company. One of the largest multinational investors in the country, PepsiCo has established a business which aims to serve the long term dynamic needs of consumers in India. PepsiCo nourishes consumers with a range of products from treats to healthy eats that deliver joy as well as nutrition and always, good taste. PepsiCo India's expansive portfolio includes iconic refreshment beverages Pepsi, 7 UP, Mirinda and Mountain Dew, in addition to low calorie options such as Diet Pepsi, hydrating and nutritional beverages such as Aquafina drinking water, isotonic sports drinks - Gatorade, Tropicana 100% fruit juices, and juice based drinks - Tropicana Nectars, Tropicana Twister and Slice, non-carbonated beverage and a new innovation Nimbooz by 7Up. Local brands - Lehar Evervess Soda, Dukes Lemonade and Mangola add to the diverse range of brands. Performance With Purpose articulates PepsiCo India's belief that its businesses are intrinsically connected to the community and world that surrounds it. PepsiCo is dedicated to producing the safest, highest-quality and best-tasting beverages and foods in every part of the world. Developing and maintaining robust food safety programs is how we assure safety for every package, every day in every market. PepsiCo has detailed internal programs and procedures for food safety. Teaching children sensible eating habits at an early age is a critical part of their up-bringing. As a major advertiser, we need to do our part to help parents succeed in this task. Our approach has been to join a leading set of other food and beverage companies in agreeing to change what younger children are seeing advertised on TV and in other media, such as magazines and the internet. Importantly, we are doing this in countries around the world where we do business today. Naturally, we cannot prevent children from seeing our advertising, but we can ensure that media channels that are most targeted at children carry advertisements only for certain products. From PepsiCo's perspective, these are products that meet specific nutrition criteria intended to encourage the consumption of healthier foods and beverages. The policy covers our entire product portfolio and is subject to independent compliance monitoring by Accenture. PepsiCo values the health and well-being of our associates, partners, customers and consumers. PepsiCo offers a wide range of benefits that encourages wellness, promotes healthy living and gives associates and their families tools and information to make educated healthcare decisions. PepsiCo is committed to being an environmentally responsible corporate citizen. We express that commitment in our Environmental Policy and other policies related to Environmental Compliance and Sustainability, a few of which are described in more detail below. PepsiCo's Environmental Policy applies to all our operations. PepsiCo monitors company-owned operations and joint ventures where we hold a majority share. We encourage our suppliers, service providers, bottlers and other partners to adhere to the policy. We have developed and published our Global Sustainable Agriculture Policy, which demonstrates our approach to sustainable development across our entire agriculture supply chain, including water savings, waste reuse, soil protection and chemical use. 2009 was a year of immense joy & pride for PepsiCo India. We were able to give back more water than we consumed, through our various initiatives of recharging, replenishing & reusing water. PepsiCo India continues to strengthen its Solid Waste Management initiatives in partnership with Exnora, an environmental NGO. This award winning, income generating partnership provides a clean environment to more than 450000 people across Pammal, Chennai, Nagapattinam, Tenkasi and Cuddalore in Tamil Nadu, Sangareddy in Andhra Pradesh and Panipat, Haryana. Unique income generating partnership with leading environmental NGO, Exnora, a pioneer in waste management. Community members enjoy the benefits of a clean environment and are educated on how to recycle waste, not just relocate it. Households segregate their bio-degradable waste from their recyclable waste. Bio-degradable waste is then converted into organic manure through the process of vermi-culture. Programme recycles 97% of household garbage; this project provides livelihood to more than 500 community members. Bio-degradable waste is converted into high quality organic manure through vermi-culture. Recyclable waste such as PET and plastics, waste paper and tetra packs are recycled. Community awareness programme includes door-to-door campaigns and street plays to motivate people to segregate organic and inorganic garbage at source to enable recycling. Every aspect of programme built around Community and Government participation to help programme evolve into a self sustaining model. The unique PepsiCo-Exnora initiative in Pammal was awarded the environmental Golden Peacock Award for Innovation in 2006. Zero Solid Waste Centre in Pammal was recognized as a model project by UNICEF in 2007. PepsiCo- Exnora Waste to Wealth program won the BSE NASSCOM Social and Corporate Governance Award 2008. PepsiCo India continues to strengthen its partnerships with farmers across the country to boost their productivity and income. The plan is to strengthen farmer connect from 21,000 in 2009 to 50,000 by 2012. Strengthening farmer connect from 21,000 in 2009 to 50,000 by 2012. Building PepsiCo's stature as a development partner by helping farmer grow more and earn more. Introduction of new high yielding varieties of Potato, Oats, Citrus and others. Introduction of sustainable farming methods and contract farming. Making world class agricultural practices available to farmers. Working closely with farmers and state governments to improve agri sustainability, crop diversification and enhance farmer incomes. Helping farmers refine their farming techniques and raise farm productivity. Customized solutions to suit specific geographies and locations. Facilitate financial and insurance services so as to de-risk farming. In order to provide its farmers "The best quality potato seeds", PepsiCo collaborated with the Thapar Institute of Technology to develop quality potato mini-tubers. PepsiCo has also made an investment in a world class potato mini-tuber facility at Zahura in Punjab which helps getting robust and disease-free seeds to its contract farmers. PepsiCo has pioneered the concept of contract farming under which the company transfers agricultural best practices and technology and procures the produce at a pre-agreed price. A 27-acre research and demonstration farm was set up in Punjab to support the initiative to conduct farm trials of new varieties of potato, chilli, corn, peanut and other crops. PepsiCo India's technical team implemented a high quality seed programme to deliver early generation and disease-free seeds to farmers. World class, top quality, high-yielding potato varieties introduced. High yielding potato seeds have enabled farmers to produce world class potatoes and procure higher returns. PepsiCo India has partnered with more than 11,000 farmers working across Punjab, U.P., Karnataka, Bihar, West Bengal, Gujarat and Maharashtra for the supply of world class chip-grade potatoes. Partnered with State Bank of India to get soft loans to all its contract farmers to reduce their cost of cultivation and save them from the clutches of money lenders (higher interest rates). PepsiCo India has also partnered with 1,200 farmers in Rajasthan to cultivate barley in a tie-up with the United Breweries Group. The PepsiCo and PAGREXCO (Punjab Agri Export Corporation) partnered to start a Citrus Development initiative in 2002, marked a step forward in PepsiCo's commitment to diversification of agriculture and improvement in quality of life for farmers. Initiative has emerged as one of the most successful models of public-private partnerships in Indian agri-business and would create a localized supply base for citrus juice for Tropicana business. Project played a significant role in introducing a less water intensive alternative to crops such as paddy. Today, farmers can choose from 16 varieties of rootstock and 34 varieties of citrus, largest collection at a commercial nursery. Technical support and expertise were extended to the Punjab Government to set up two fruit processing plants in Hoshiarpur and Abohar - prime citrus growing areas in Punjab. Each plant is capable of processing multiple fruits and capable of acting as a catalyst for farmers to adopt horticulture. PepsiCo's Get Active & a Good Nutrition and Active Lifestyle Program for Children -has seen robust growth and implementation. Designed and supported by the PepsiCo Health & Wellness team, the programs have been implemented in schools in collaboration with prominent NGOs & Hriday, Swashrit and the Indian Medical Association. Get Active programs have a central objective: to raise awareness on the importance of balanced nutrition and regular physical activity for a healthy lifestyle among school children. Starting with a Breakfast Makes Me Smart module in 2008 that emphasized the importance of healthy breakfast to the My Pyramid module launched in April 2009, Get Active school programs promote learning nutrition through active engagement. 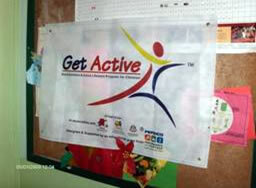 Get Active believes in combining simplicity and enjoyment. The basic principle is simple & to establish the fundamentals of Calories In = Calories Out.